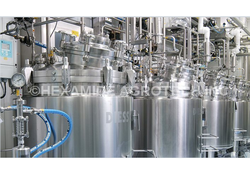 Manufacturer of a wide range of products which include industrial fermenter and stainless steel fermenter. Industrial Fermenter is available in different capacities in accordance with the varied demands of clients, fermenter effective cooling limpets as per capacity, base/ leg mounted, inside surface mirror finish, thermal wells for temperature. 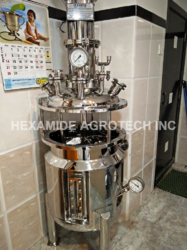 Hexamide Agrotech is the best manufacturer of Stainless Steel Fermenter in India. We give our clients different capacities of the fermenter, according to the varied needs and specifications. We give our clients the best and so we boast of being the best Fermenter manufacturer in the country. Our products are made keeping in mind the needs of the customers. The Fermenter that we develop is of supreme grade and quality.